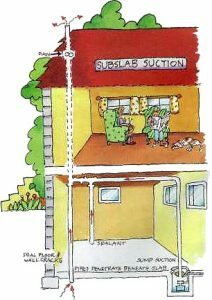 Mitigation codes require that fan placement insure that no leakage from the fan can re-enter the space inside the home. For this reason the mitigation fan placement is restricted to a few specific areas which will be determined by the design of the home. Fans are typically going to be installed in an attic, a garage (which is not under a living area such as a bedroom or play room). If neither of these locations can be used the fan can be placed on an exterior wall. The first challenge for any system design is to find a path way through the structure that is efficient and UN- obtrusive. Care must also be taken in deciding where to locate the vent stack which will exhaust the gases collected from beneath the structure. 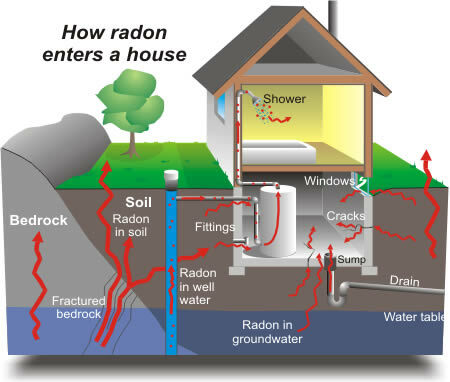 The emissions at the stack contain concentrated doses of radon which will measure in the hundreds of picocuries, as well as other soil contaminants. Placement of the exhaust stack must be at least 10 feet above the ground and ten feet away from windows, and exhaust stacks that might permit the gas to re-enter the structure. The gases will dissipate safely beyond ten feet in open air.